Snapchat Is This Your Next Social Media Sales Generator? Is This Your Next Social Media Sales Generator? There is a myth that Snapchat is for individuals only – not business. And today we’ll show you exactly how you can build a following and a brand on Snapchat that brings you new visitors, customers and sales for your business. Simply put, Snapchat is a social media platform launched in 2011 for sharing photos and videos that automatically self-destruct within seconds of the receiver opening it. It’s easy to use, and young people as well as celebrities love it. It’s also regarded as one of the best apps to send and receive pictures. And of course you can also chat and message people with Snapchat as well. Facebook tried to buy Snapchat and couldn’t, so they launched their own app called Slingshot. What, you never heard of Slingshot? Neither has most anyone else. Sorry Facebook, but Snapchat rules. So why do people love Snapchat? Besides being fun and immediate, it’s also private. You can share photos with anyone without worrying they’ll be stored and uploaded to the internet for public viewing. Since all photos and videos self-destruct within a few seconds, it doesn’t give the receiver a chance to do anything but view them. It’s really pretty self-explanatory. Download the app from the app store. It’s available on Android, iOS and Windows. Open the app, fill in your details, verify your identity and add your contacts. It will walk you through the process step-by-step, and it’ll only take a few minutes. Then pick your personal preferences and you’re ready to go. You can add taglines or short captions to your photos, as well as adding filters. Then you can send your photos and of course receive them as well. You also have the option of adding stories. A story can be a video or series of pictures that lets followers know what you’ve been doing, or whatever you want to share. A story lasts for 24 hours and then it self-destructs. You can also start chat sessions with your followers. It works much like any other chat messenger, with one exception: You won’t be able to read the chat once you close the window because it will have self-destructed. We already mentioned the most prevalent myth – that Snapchat isn’t for business or doesn’t allow marketing. Not so. If you look at the storytelling feature of Snapchat, you’ll see it’s highly effective for promoting campaigns, products and so forth. And because it’s done in pictures and videos (with or without captions) it’s easier and faster for people to consume than a written work. Another myth is that it takes too long to establish yourself on Snapchat. This is going to depend on how interesting your campaigns are and how many followers you can initially bring into the platform. By leveraging followers you already have in Facebook, Twitter, email, your website and so forth, you can begin with a large following in place. Then there is the myth that Snapchat is overshadowed by other platforms. This is an apples and oranges comparison, since there is no other platform exactly like Snapchat. Facebook and Twitter are message based, Snapchat is image based. Facebook and Twitter appeal to an older crowd, and Snapchat appeals to a younger (under 40) crowd. Snaps – Individual pictures that are sent and received in Snapchat. Snapback – A reply given to a particular snap. Story – A collection of pictures or snaps that can be added one by one to the account. These can be viewed by your followers as many times as they want, but the story is available for only 24 hours. Scores – Stats provided to an individual based on the number of snaps received, sent, snapbacks and so forth. Snapcode – An easy way to add new friends to your account by simply scanning and adding. Snapstreak – The consecutive number of days you have been sharing snaps with your friends on Snapchat. Friends – Individuals added from your contact list. Followers – People who are following you, but you aren’t following them. Lenses – Different modifications you can use for your snaps. Lenses are free and change frequently. Filters – Overlays that can be added to your pictures. If you’re thinking Snapchat is just a high schooler’s toy, you might want to reconsider. Plenty of adults, brands and businesses now use Snapchat, which is why it’s become a viable tool for reaching your customers. 1. It’s where the under 40 crowd hangs out. Snapchat is now perhaps THE best way to reach a younger audience. Once Facebook went mainstream, young people left in droves. Where did they end up? Snapchat. 2. Mobile is taking over the marketing world. Over 50% of people in the United States use their mobile device more than their desktop or laptop to stay on top of trends and research products. 3. It’s timely. You can create a quick tip video, upload it and get views almost immediately. And since the messages expire, it has an immediacy you can’t find anywhere else. 4. Building real relationships. You can send messages directly to individual followers, building deeply personal relationships with them. With other social media networks, this is almost impossible to do. 5. Targeting is user friendly. While Snapchat doesn’t have fancy targeting methods, what it does have is user friendly and simple enough that you can find your true audience. 6. Engage your audience. You can run a campaign where your audience watches a video to get a promo code. Or you can hold a contest. Or have a campaign where your audience takes snaps of your product. The possibilities are fun and exciting. 7. No force feeding. Unlike many other advertising methods, Snapchat won’t repeatedly force ads in front of an audience. This means users who do view your ad will have a more positive experience of the ad and your brand. 8. It’s easy to partner with influencers. There are so many well-known personalities using Snapchat these days, it’s easy to discover big names. And these folks can help you reach audiences you’d never before considered. 9. Snapchat was actually made for mobile. This means your video will show full screen – even when vertical – unlike Facebook or Youtube. This makes for a better user experience. 10. It’s cool. Facebook tried to acquire Snapchat with a $3billion offer. Snapchat said no. So why did Facebook want Snapchat? Because they wanted to be cool again with the younger audience. 11. The time is right. Advertisers haven’t yet flooded Snapchat with their marketing messages, so you can get ahead of the game. 12. The audience is huge. Over 100 million users are already on Snapchat. And it’s growing fast, too. Seriously, what are you waiting for? Are you looking for ways to attract new Snapchat followers? While Snapchat can be a great way to get your marketing message out, it’s can be a challenge to get discovered by other users. That’s why we’re put together this handy little guide to get you started. 1: Add friends from your address book. On the Snapchat home screen, tap the ghost icon and then tap add friends. Snapchat will crawl through your address book to see if your contacts’ phone numbers are associated with a Snapchat account. If they are, you can add them as a friend, and when you do, they’ll get a prompt to add you back. As a business owner, if you have a customer database with phone numbers, you can import that data into your address book on your iPhone or Android and follow the same steps. And you can also import the phone numbers of Facebook friends to your Android or iPhone address book to see which ones are on Snapchat. Just tap settings, then tap Facebook, then tap Update all Contacts. 2: Let your email subscribers know you’re on Snapchat. Send out an email to your list asking them to add you to Snapchat. Yes, it almost seems too easy, doesn’t it? While you’re at it, drop your snapcode in your email newsletters. You’ll pick up new followers each time you send out an email. 3: Add Snapchat to your website. You probably already have a “Like us on Facebook” and “Follow us on Twitter” on your website. 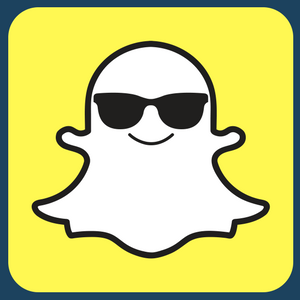 So add your snapcode into the same area, linking the logo to your personalized URL which should look like this: snapchat.com/add/yourusername . Visitors will be able to scan the snapcodes from desktop or mobile to add them. Put your snapcode on the door, using a tool such as Sticker Mule to print the decal of your snapcode. This will let local customers know you’re on Snapchat, which should get you more local followers. And if you have business cards, don’t forget to put your snapcode on those as well. This can lead to more dialogue with sales prospects on Snapchat, and more sales. Use a service such as SocialOomph to run an auto-DM campaign, sending a direct message to new Twitter followers with a link to your Snapchat URL. Ask them to add you on Snapchat. You’ll want to make your snapcode clearly visible on each social media channel where your business has a presence. You can really make your snapcode visible by going dark on all of your other social media channels for one day each week. Simply send out calls to action on those other channels, letting people know you’re putting on quite a show on Snapchat today and they should join you over there. By placing exclusive content on Snapchat, it gives your social media followers on other channels a real reason to find you and friend you on Snapchat. You can team up with influencers in your niche or industry to spread the word about your business and drive followers to add you on Snapchat. The trick here is to find influencers who have audiences that match up with yours. If your audience is 100 people and theirs is 100,000, it’s probably not something that’s going to interest them. Try doing Google searches for specific keywords that help you locate people who are already speaking about your niche. Then team up, doing a cross promotion that builds both your audience and theirs. Well that sounds scary, doesn’t it? But it works really well and done right, there is little to no risk. Use social listening tools to find your superfans. These folks are also what you might call micro-influencers because they do influence their following. They’re already tweeting about your brand, posting relevant content in your niche and so forth. Offer them free products in exchange for their reviews, and let them take over your account to tell people how much they love your products. Deep ad-targeting is easy on Facebook, so try using Facebook ads to get your snapcode in front of fellow Snapchat users. Optimize your ad for engagement so that Facebook serves the ad to as many people as possible, driving as many clicks, likes and comments as you can. One $50 ad spend test resulted in over a thousand new Snapchat followers, so this can be a cost effective method of reaching new audiences. Remember to target the exact people you would most like to follow you on Snapchat. Snapchat added a feature that allows you to ask your followers to suggest your account to others, much like you might ask for a like, retweet or subscription. You ask your users to suggest your account. Your users then tap on your name and tap on the arrow icon. Then they select who they would like to share your account with. Growing your Snapchat following isn’t as hard as you might think, once you start using some of these techniques. But remember, increasing your following is just one part of your Snapchat marketing strategy to grow, engage and convert. Keep your followers engaged with relevant content and you’ll be well on your way to Snapchat marketing success. There are two kinds of businesses right now – those who are taking advantage of Snapchat before other businesses find out they should be on it – and those who will wish they’d had the foresight to jump on Snapchat back in 2017. So what are some marketing strategies you can use on Snapchat for growing your business? Make your fans feel like insiders by providing content you offer nowhere else. Your goal is to make users feel like they’ve got exclusive access to insider info. This develops emotional connections between them and you and your content. For example, you might provide tips or inspiration in the form of 24-hour Snapchat stories. Give your fans the keys to success, daily insights, advice and so forth to create a sense of trust and inclusivity. Surprise your fans with promotions and giveaways to build customer loyalty. Contests work wonders on snapchat and they’re easy to do. Your contest can be as simple as naming a product, captioning a picture, taking snaps with your product and so forth. Announce your Snapchat contest on all of your social media channels, and make the prize suitable for the target audience you want to attract. You can also offer insider access, promo codes or discounts with a Snapchat scavenger hunt. Build anticipation for the event prior to the launch date. You might even do something as simple as sharing a daily deal with your followers by giving them a special Snapchat referral code. This is a great way to get them to spread the word about you. And you can track customer behavior by monitoring how many promo codes are used. Ask for your followers to participate, creating a two-way conversation with the community. For example, ask them to send a selfie featuring your product. Or ask them for a picture that illustrates an answer to a question. Or have them create videos on why they love your product or how they relax at the end of the day or whatever is appropriate to your niche. Make sure you reply to your fans. You can do this either by replying in the chat feature, or sending back a photo of you thanking them. It pays to go the extra mile to make users feel special and a part of your community. Snapchat takeovers give people you select access to your Snapchat account, so they can create stories promoting and enhancing your brand’s personality. When you let advocates take over, your account seems less promotional and more fun and authentic. If you’re worried by what might happen, it’s not like the monkeys are taking over the zoo. Rather, it’s influencers and fans chosen by you who agree to ‘be’ you for a day. For example, let’s say your niche is gardening. You ask a master gardener to show off her garden and those of her neighbors using your account. Or if your niche is relationships – you can let one of your clients tell the story of how you saved his marriage. Really, you’re only limited by your imagination. Snapchat enjoys the highest growth rate of any social media channel right now. So if you’re not there, you are missing out on some major exposure for your business. That said, remember that Snapchat is about the fun, not about bragging about your product or hammering prospects. Find the light-hearted angle to your business and use that to help your followers achieve their goals and you’ll build brand loyalty unlike anything you’ve achieved on Facebook or Twitter.